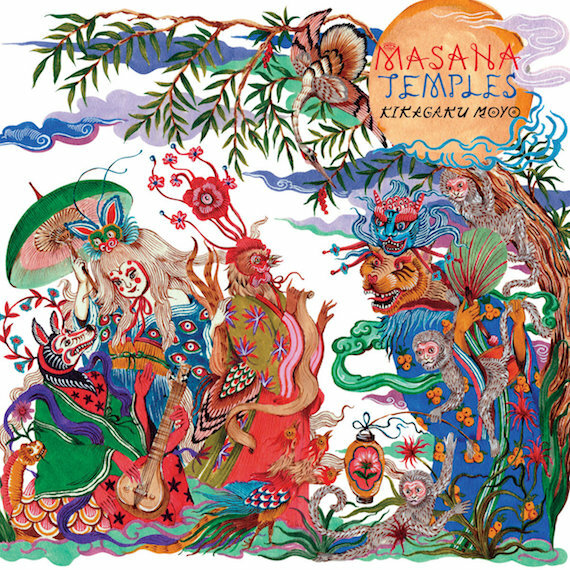 Japan has a long and fascinating history with psychedelic music, and its breadth of style is something increasingly reflected in the work of bands like Kikagaku Moyo, who are set to release their latest full length, the stunning Masana Temples, on October 5th, We caught up with drummer Go Kurosawa via email ahead of their upcoming U.S. tour, discussing the new album, their tendency to only do one or two takes in studio, the sustained mystery of the album title, and what gifts you should bring to upcoming shows. Aquarium Drunkard: The band traveled to Lisbon, Portugal to record Masana Temples and work with jazz musician Bruno Pernadas as producer. How did you end up connecting and working with him? Kikagaku Moyo: We discovered his solo albums sometime last year and we were playing them a lot during the tour. We were planning to record a new album and wanted a producer who would have a different outlook than the ones we have. One day we just wrote an email and asked him if he’s interested [in] producing our new record. He didn’t know about us, and I thought that was a good sign. He has self-produced all his own records but he never had produced other people’s work, so that was also more challenging and exciting for us. We were super happy about the outcome and really honored to be able to work with him and get some his ideas. AD: As opposed to previous albums, various members now live in different places, other countries even, rather than all together in Tokyo. How did that change the writing and recording of this album versus previous ones? 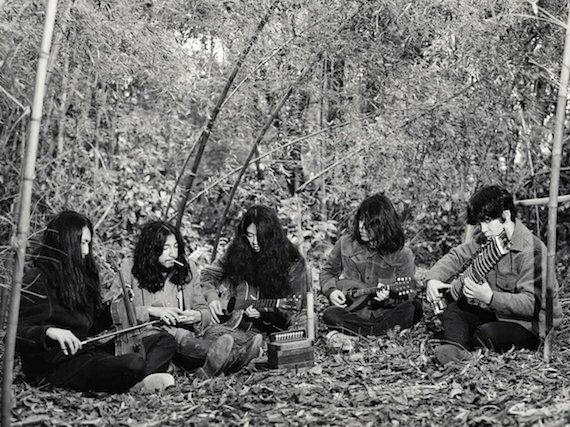 Kikagaku Moyo: When we were all living in Tokyo, we would get together, hang out, and talk about so many things and jam all the time. Now we might live apart but we are also together 4-5 months, 24 hours a day, during tours, and we do the same things — hang out, play music or play video games. I think one big change is that all of us have more individual time and different inspirations. We talk on Skype pretty often and share what we’re listening to, or what we are working on. We have this dropbox which we all put our ideas every week, it’s a bank of ideas. When one of us wants to write a song, we take ideas from the bank and try to combine with our own idea. Since we don’t have time to practice as much these days, when a song is 60-70% complete, we will play it live at shows and see how we and the audience feel before we’ll call the song finished. AD: An interview you gave in 2014 stated that the band typically didn’t do more than two takes on a song in studio – so mistakes and all could be included as an honest representation of the band. Is that still the case? Did Pernadas challenge your recording methods in any way or was he more sympathetic to your usual methods? AD: In that same interview you talked about not thinking of your music as ‘art’ but as something more primitive and impulsive – something that brings pleasure to body and soul. With the limited takes on songs in studio, how do you feel about the recorded Kikagaku Moyo versus the live performances you give? How do these songs continue to evolve in a live setting? Kikagaku Moyo: We still play earlier songs in the set and they all evolve differently. I always notice when we try to play songs properly, even in jam part, so I’ll change the rhythm completely and see how everyone reacts. This is the most fun part of playing live, the chance to do something completely different than usual. There are some songs that we want to play like they are on the record but there are some songs that we want to change. When we don’t remember what we play right after the set, I think that’s a good sign. Because we didn’t really think about it and it’s like you made a journey and each stop is a song on the set list. We always take different route and feel good about the whole journey not each stop. AD: American composer John Philip Sousa wrote an essay in 1906 lamenting the rise of Victrolas and recorded music players because of how he thought it would separate people from music; he thought it would encourage them not to learn how to play instruments or even remove us from the emotion of music altogether. “The whole course of music, from its first day to this, has been along the line of making it the expression of soul states,” he wrote. Do you agree in any way with that idea? Is that view similar to what leads you to try and capture as much immediacy in your recordings as possible? Kikagaku Moyo: I see his point and agree in some ways. I think people who have seen Jimi Hendrix perform live have had a different experience than someone who has only heard his record. I am not sure if it removes the emotion though, that’s up to the listener. For us, being ourselves live or on recordings is important. Doing what we like, being who we are, and being true to ourselves is very important. Even we make a mistake, that’s us. AD: What effect did being in a completely different place than normal – Lisbon, Portugal – have on the recording? You recorded your previous EP in Prague, so maybe this wasn’t as strange an experience? Kikagaku Moyo: It was actually a strange feeling because we were touring the U.S. in March and flew to Lisbon directly. It was so cold in the U.S. and we all got sick. As soon as we arrived in Lisbon, it was such nice warm weather and very sunny. We took a walk by the ocean and the recording studio was surrounded by trees. This sunny/summer vibe has definitely affected this record. AD: Tell me a bit about the new album title. ‘Masana’ is a concept of a Utopian society – was it created for this album? Is each song a ‘temple’ that defines some aspect of it, or is there another meaning for the album title? Kikagaku Moyo: No answer as I want to make people guess. AD: You are finishing up a tour through China and then are off on a rather lengthy trip through the U.S., up into Canada and finishing up winding through Europe. Are there places that you enjoy playing in particular whether it’s because of audiences or the surroundings? Kikagaku Moyo: This is our first time to tour in Asia. We were in Indonesia and now we are in China. Compared to the west, Asian countries have totally different history and background of music and its industry. We just played at a festival in Bali, Indonesia and the stage was surrounded by huge stones and there was a big statue looking down the stones. It was literally Stone Garden x Masana Temples. AD: Do you still feel that you get a better response from Europe and the U.S. than you do in your own country? Does that feel odd in any way, or does it not really bother you? Kikagaku Moyo: Yes, we have bigger audience in Europe and the U.S. than Japan. It doesn’t bother us. Just because we are from Japan that doesn’t mean we’d have a bigger audience. We see the world more flat and we go play where more people want to hear us. AD: The last time we interviewed you, you talked about Japan’s “pay to play” system for most bands, making it prohibitively expensive for smaller bands to even be able to perform. In bringing together smaller bands through your label and the monthly psychedelic nights at the bars you found that would let you set up, have you been able to put a dent in that culture and open it up more for smaller artists to play? Kikagaku Moyo: I’ve been mentioning this issue since I started getting interview requests. But since almost all the interviews of ours are from foreign media, I’m not sure how it’s really affecting things. The pay to play system aka “Noruma” system still broadly exists in Tokyo but some venues started changing the system partly because some venues are closing down because people have stopped coming. I think that’s a good sign and people will start looking for alternative solution like more DIY rather than just doing what everyone else is doing without any doubt. AD: You’ve got a pretty amazing video for “Nazo Nazo” off of the new album. I know a lot of people’s reactions to videos like that are: “I don’t get it.” But much like the music, I imagine the imagery is more about invoking a feeling and less about more specific meaning. It was directed by Elliot Arndt, a London-based film maker who has done a number of music videos. Was all of this designed by Arndt, or was there band input or how did it come together? Kikagaku Moyo: We really liked his band Vanishing Twin and always watched their videos. We contacted him earlier last year. Tomo made the melodies and I was seeking different voice sounds. The melody reminded me an old Japanese folklore songs and I put random words and sentences together and the lyrics started to have meaning. Eliot asked me to translate so I sent him very strange translation which made no sense but somehow it made sense for him and he made the video. We were surprised how he used color and how beautiful it is. AD: We’ve moved so far away from the days of music videos being a major promotional item – at least here in the United States. What benefit do you see in doing videos for singles in 2018? Kikagaku Moyo: I am not sure how the benefit but at least it has subtitles so now people can sing along with Tomo, haha. AD: For those of us here in the States who are going to catch you on tour, anything you’d like us to bring you as welcome gifts?